The first Wednesday of the month and time for the Insecure Writers Support Group, the brainchild of Alex Cavanaugh, everyone's super ninja friend. Please go to his blog to find out details on how to join, or just to say hi! 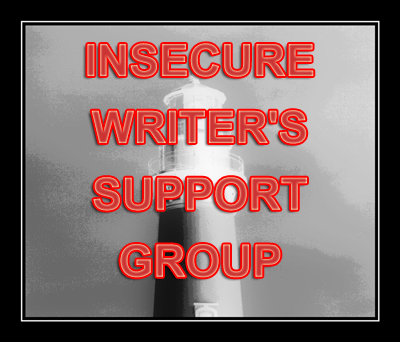 All writers need support, insecure or not this is the perfect group for encouragement and lasting friendships. Not many writers publish their work expecting to find a pot of gold, riches, fame or fortune. I know that I didn't. I just like to tell stories and share them with others. Hoping to put a smile on someones face or touch someones heart was good enough for me, but after publishing three short stories and one book I still have no idea how many people I have reached. All profits from my short stories went to charity and I am still waiting to here from my publishing company for a sales report on my book. It is frustrating to wait and I wonder if I can really call myself an author, when I have spent alot of money and time writing but have not earned one single cent. Writing is a lonely business isn't it? I doubt there will ever be a pot of gold but I still would like to know that I am being heard. Can you hear me? November is a dark, stormy, cold time of year and this year is especially hard for me. My writing has to wait for now, as with most everything else in my life. I face my mother's slow disappearance into dementia and I fight the health system alone. It is very hard to live on the other side of the world from the rest of your family when this kind of thing happens. Pot of gold? I would settle for just a little sunshine. Come back on Friday for the Oh, How I miss you Blogfest. Until then my friends, give your mother a kiss while she still remembers who you are! I'm sorry about your mother, Siv. Outside of watching Amazon rankings, I don't know how to tell how many people we've reached. But even if it's just one, that matters. I'm very sorry to hear about your mother's struggles, Siv. Your mother--and family--feel your love, no matter how far away you are. I don't live nearly so far away as you, but I did move considerably farther away from my family over the summer. And they don't travel much, or have the finances to do so in many cases, so it feels like I might as well live across the world most days. And it crushes me. But I know deep down that people have to live their own lives. Your mom is living hers, and you're living yours. There's nothing shameful about that. *hugs* Hang in there Siv. You are an author. Your book is out there and people can find it to read. Money or no, that makes you an author. Wish I could send you a bit of sunshine to help. Some months are simply WORSE than other ones. May has been a bad month for my family. My grandmother and great-grandmother died not knowing who they were or who anyone else was. Dementia and Alzheimer's are the worst sort of theft. The body often remains healthy while the brain goes. I worry that my mother will go the same way and then I will follow her. It is important to love the people we love while we can. I hope you can get busy with some kind of writing project. I hear that's the best thing for a writer with the blues. Siv, my heart goes out to you. I watched my mom disappear via Alzheimer's. It's so difficult. Hugs. Hang in there. I kept a journal to help me remember when certain things happened to my Mother In Law when she started to exhibit dementia. Big hugs, Siv, thinking of you. Know how you feel. And wish I could kiss my mom. The loving moments you had with your mother while she was herself can never be taken from you. As a baby, you comprehended so little and your mother took care of you -- now, sadly, the roles are reversed. I grieve with you. No one buys my books either. All we can do is try. Sometimes the magic works, other times all we have is the knowledge that we gave it our all. My mother experienced this with her mother and even though I was a teen at the time, I could tell how very hard it was on her. In fact my mom dreaded the same thing happening to her and fortunately it did not. As for the writing, it can be a long and discouraging road to be sure! Nothing inspiring to add to that lol. It's hard to watch our parents age. I call my mom often, just to hear her voice - while she still knows me. I feel for you. So sorry to hear about your mom. That is a horrible disease, and you must feel so far away right now. You ARE a writer and I'm looking forward to reading your book. It hasn't come in the mail, yet. Best wishes as you move through the dark months and wait for sunshine.